In September 1999, an earthquake devastated much of Taiwan, toppling buildings, knocking out electricity, and killing 2,500 people. Within days, factories as far away as California and Texas began to close. Cut off from their supplies of semiconductor chips, companies like Dell and Hewlett-Packard began to shutter assembly lines and send workers home. A disaster that only a decade earlier would have been mainly local in nature almost cascaded into a grave global crisis. The quake, in an instant, illustrated just how closely connected the world had become and just how radically different are the risks we all now face. End of the Line is the first real anatomy of globalization. It is the story of how American corporations created a global production system by exploding the traditional factory and casting the pieces to dozens of points around the world. It is the story of how free trade has made American citizens come to depend on the good will of people in very different nations, in very different regions of the world. It is a story of how executives and entrepreneurs at such companies as General Electric, Cisco, Dell, Microsoft, and Flextronics adapted their companies to a world in which America’s international policies were driven ever more by ideology rather than a focus on the long-term security and well-being of society. Politicians have long claimed that free trade creates wealth and fosters global stability. Yet Lynn argues that the exact opposite may increasingly be true, as the resulting global system becomes ever more vulnerable to terrorism, war, and the vagaries of nature. From a lucid explanation of outsourcing’s true impact on American workers to an eye-opening analysis of the ideologies that shape free-market competition, Lynn charts a path between the extremes of left and right. He shows that globalization can be a great force for spreading prosperity and promoting peace—but only if we master its complexities and approach it in a way that protects and advances our national interest. Barry C. Lynn is a fellow at the New American Foundation in Washington, D.C. He has reported on business from around the world and served as the executive editor of Global Business magazine for seven years. His views have been sought by U.S. politicians as well as by the governments of France, Japan, India, and other nations. His work has been supported by the Rockefeller Foundation. He lives in Washington, D.C., with his wife and two children. “Striking in its clarity and originality... 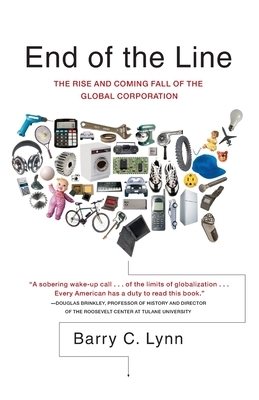 Merely for cleanly spelling out the fragility of our globalized production system and what needs to be done to avoid the possibility of catastrophic failure, this is one of the most important books on globalization in a decade."